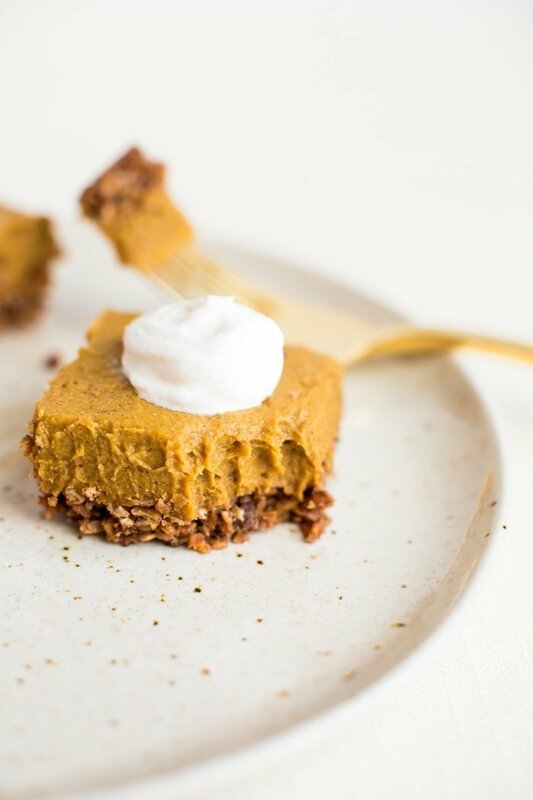 These decadent no bake pumpkin pie bars pair a crunchy granola crust with a creamy, thick pumpkin filling with coconut oil and cashew butter. Vegan & gluten-free. This post is sponsored by Nature’s Way. Last week I shared a sweet and savory wild rice stuffing recipe for Thanksgiving, but now it’s time to move on to dessert! Dessert is the best part about the holidays anyhow, amirite? Of course pumpkin pie is a quintessential Thanksgiving dessert, but I honestly think no bake versions of pumpkin pie are even better than the baked version. The filling has such a great texture because it is chilled, thick and creamy. I enjoy it so much more than the fluffy custard-like filling that pumpkin pie can sometimes have. 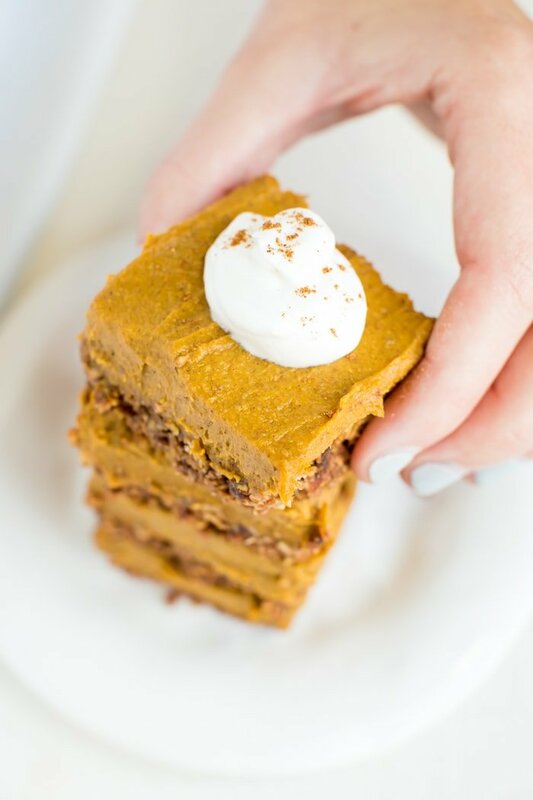 If you’re in the same boat, you will LOVE these no bake pumpkin pie bars! And the whole no bake thing means that you don’t have to deal with the hassle of an oven, which works out perfectly considering most folks have a big ol’ turkey and lots of sides hogging all the oven space on Thanksgiving Day. 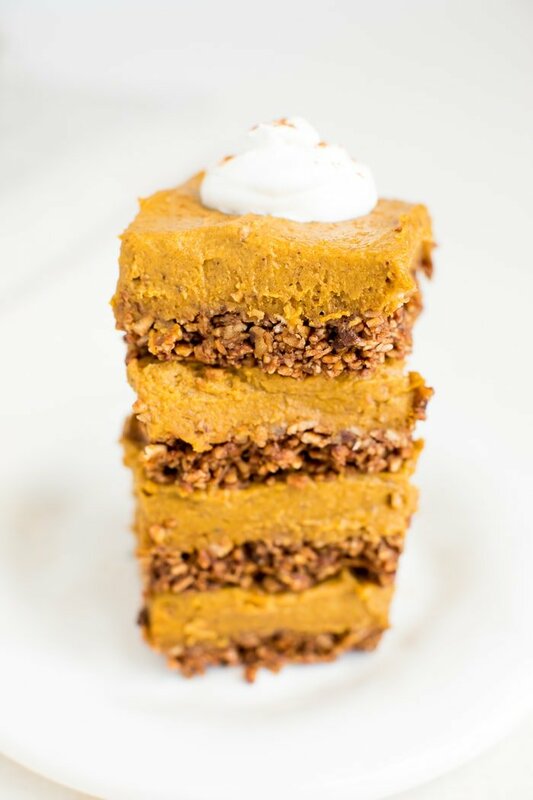 As I mentioned, the filling in these no bake pumpkin pie bars is especially rich, thick and creamy, but the best part might be the granola crust. By using only three ingredients, coconut oil, dates and granola, you can have yourself the perfect crunchy crust that holds together well. I’d personally choose a granola crust over a graham cracker or shortbread crust any day! As you’ll notice, this recipe doesn’t require any butter for the crust or binders for the filling and that’s because we’re using coconut oil. Coconut oil hardens up when it’s chilled and helps to hold everything together. Of course the dates and cashew butter also help to thicken up the pumpkin pie filling, but the coconut oil is definitely the saving grace when it comes to keeping the crust together. I’m sure most of you are fully aware, but coconut oil is great for vegan baking/desserts. I use it all the time! For this recipe I’m teaming up with Nature’s Way and using their organic extra virgin coconut oil which is cold pressed and not refined, deodorized or bleached. 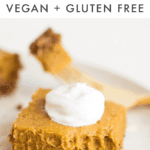 If you’re like me and enjoy getting a few things knocked off your list before Thanksgiving Day, than this recipe is perfect for you as the pumpkin pie bars need a few hours to set up so you’re forced to make them in advance. This allows you to get it out of the way so come Thanksgiving Day you can serve your delicious dessert with minimal effort. Enjoy! 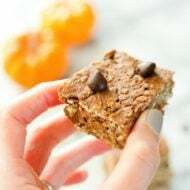 If you make these no bake pumpkin pie bars be sure to leave a comment and star rating below letting us know how it turned out. Your feedback is so helpful for the EBF team and our readers! 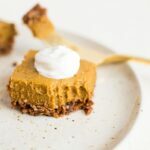 These decadent no bake pumpkin pie bars pair a crunchy granola crust with a creamy, thick pumpkin filling with coconut oil and cashew butter. Vegan & gluten-free. Add granola to a food processor and process until the granola is the size of graham cracker crumbs. Add coconut oil and dates to the food processor and process until mixture is well combined and sticking together. Pour crust mixture into an 8×8 baking dish lined with parchment paper. Use your hands to press the mixture firmly into an even layer along the bottom of the dish. Place dish in the fridge to allow the crust to harden up. Wipe out your food processor container, replace blade and add dates to the processor. Process until dates have turned into a sticky paste. A ball might form and this is okay. Just break the ball apart with your hands. 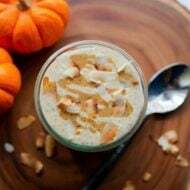 Add remaining pumpkin filling ingredients to the processor (pumpkin, cashew butter, coconut oil, pumpkin pie spice, vanilla, sea salt and cinnamon). Turn on food processor and blend until mixture is completely combined and smooth. There may be a few specks of the dates visible, but the mixture should be smooth. Grab crust from the fridge and pour pumpkin pie filling over it. Use a spoon or spatula to spread the filling evenly. Place dish back in the fridge for at least 4-6 hours, but overnight is best. This will give the mixture time to thicken and set up. Once set, remove from the fridge, cut the bars and serve. Top each bar with a dollop of coconut whipped cream for serving if you wish. *I tested the recipe with 3 different varieties of granola and the crust held together each time. I found the Purely Elizabeth granola worked best. If your crust seems dry and doesn’t seem to be holding together well, add another 1-2 Tablespoons of coconut oil. **The bars are fabulous on their own, but feel free to spruce them up with a dollop of store-bought or homemade coconut whipped cream. 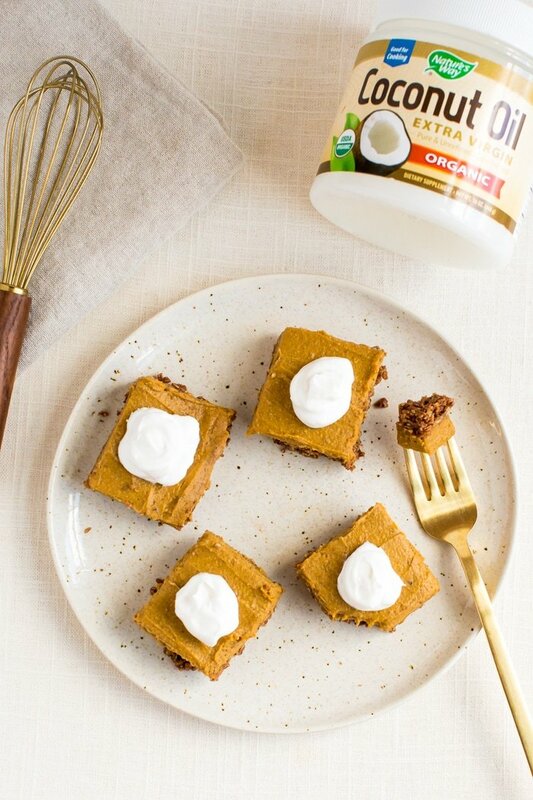 If you make these no bake pumpkin pie bars let me know how it turns out in the comment section or share a photo on social media. Just be sure to tag me (@eatingbirdfood + #eatingbirdfood) so that I see it! What could you use in place of the dates? Could you use monk fruit sweetener? I haven’t tried this recipe with monk fruit sweetener, but you could definitely test it out. Be sure to let me know how the bars turn out if you try it. 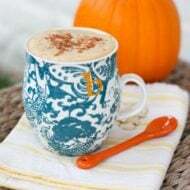 The combination of pumpkin + dates + granola in this recipe sounds amazing! Thank you for sharing! I have a nut allergy here. Do you think I could substitute sunbutter? I think sunbutter would work, but I haven’t tried it! Let me know if you do!! This sounds tasty. I plan to make it at Thanksgiving. I notice when I adjust the servings, nothing is said about the size of the pan. So, for 12 servings would you still use an 8 x 8 pan? Thank you. The recipe currently makes 12 servings and uses a 8×8 pan. How many servings are you trying to make? Twelve servings. So, that answers my question about the pan size. I just thought I might need to use a larger pan. Thank you. Hi Nick! Thank you so much for leaving this feedback. I’m curious to know what type of granola you used? I tested the recipe with three different types and they all held together, but there are a ton of different granolas on the market so perhaps your granola was drier or perhaps less sweet, which made it less likely to hold together. I found that Purely Elizabeth’s Cranberry Pecan granola worked best for me. If you decide to make the bars again perhaps try them with a different granola or add more a bit more coconut oil to the crust. I hope this helps!! Could I substitute almond butter instead of cashew? Not sure if it would alter the taste too much. Hi Grace. I think cashew works best because it’s extra creamy, but almond butter will likely work too. Although I haven’t tried it so I’m not entirely sure how it will turn out. Let me know if you decide to try it! I don’t have a food processer. Would a Blendtech work? Also, could I melt the coconut oil, before mixing it with the granola? It seems like it would mix better that way? Then it could harden up in the fridge? I made them! The Blendtech worked ok. I pretty much just mixed the coconut oil and granola with my hands because it wasn’t working in the blender. It did blend up the granola well though. I had to use more than one tbs of oil too. With the filling, the dates didn’t blend up very well by themselves, but it all mixed together pretty well when I put in the other ingredients. They turned out really good!! Thank you for the recipe!! Oh, also I didn’t wash the dates and then I noticed it said to wash them on the package! Oops. Do you usually wash the dates? Hi Heather. I’m so glad it worked out with a few modifications! So strange, I’ve never seen a package of dates that said to wash them… where are the dates from? I got them from Walmart. They are Bard Valley Natural Delights brand. It just says on the back “We recommend that you wash your fresh Medjool dates immediately before enjoying them.” It says they were packed in Yuma, AZ. Oh, and now I just noticed on the side it says product of Mexico. Do you think coconut butter would work in place of the cashew butter? My kids have but allergies. I’m so sorry you didn’t love these, Bob! Hey Jen! I didn’t soak the dates and I don’t think you’ll need to unless you’re dates aren’t super fresh and seem dry. If they feel moist you should be fine, but if they’re dry and turning a little white then it might be a good idea to soak them — especially for the dates that are used for the pumpkin filling. I had trouble with this, probably because I have a small food processor that’s part of a hand held immersion blender set. So I had to physically press the button to keep it processing. I don’t think the dates are as well integrated in either the crust or the filling as they are supposed to be. It’s in the fridge now and I’ll see what it’s like in the morning. But I an see small chuck of dates in both and I suspect that’s not how it’s supposed to be. I made this recipe twice so far for Thanksgiving and it was super easy and super delicious! Both groups of people loved it and wanted to know the recipe. The coconut whip cream was a nice added addition on top as well!